Another complication crops up when there are unpaired electrons. This is well illustrated for nitrogen dioxide. So, for NO2 there is an integral number of electrons but a non-integral number of electron pairs. Since any orbital can accommodate 0, 1, or 2 electrons, 21/2 electron pairs must be placed into three orbitals. Therefore the geometry is based upon a trigonal-planar arrangement of electron pairs. Since the lone-pair orbital is only half filled, it demands less space, and the O-N-O angle opens out a little (to 134.1°) from the ideal trigonal angle of 120°. Addition of one electron to NO2 gives the nitrite anion NO2-. This last electron completes the half-occupied lone-pair orbital and this filling of the orbital causes it to fill out, and so close the O-N-O bond angle to 115°. The geometry of nitrogen dioxide, NO2. 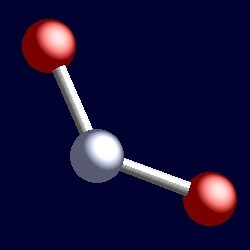 You can use your mouse to manipulate the molecule in the right hand "Jmol" image.